Our premises are located in the centre of the town, along The Grove, at the junction with Riddings Road. Use this link to Google Maps. Google has put us on the wrong side of Riddings Road, but it is close enough! 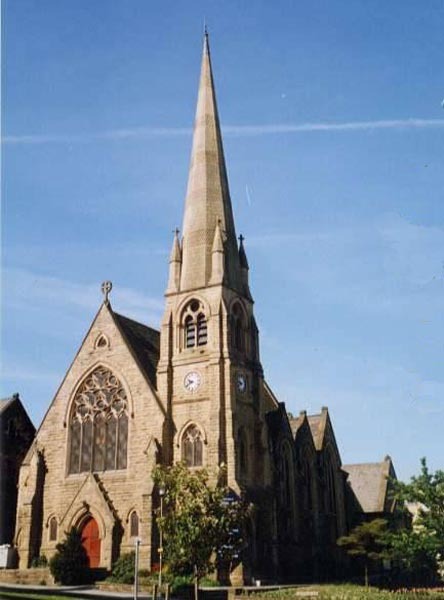 The church is a short flat walk from the bus and train stations located on Railway Road. You will see the church spire to your right once you leave the station! There is very limited short stay parking,limited to 30 minutes, outside on Riddings Road. There is additional on-street parking further up Riddings Road, on The Grove (2 hour limit) and other town centre roads, but these tend to fill up quickly during the day. The main car park is behind the Grove, accessed from Brook Street or Cunliffe Road. Charges apply between 8:00am and 6:00pm every day, with a sliding scale depending on how long you wish to stay (accurate at August 2010). Click on this link to the Ilkley Community Pages. You can see some panoramas of Ilkley by going to this commercial website: VRIlkley.